Mystery novelist Hazel Martin's maid suspects foul play when her childhood friend Doris jumps from the third-story turret of Farnsworth Abbey. Unable to resist an investigation, especially one that's staged to look like suicide, Hazel calls in help from her chauffeur, her cook, and even the mysterious butler her husband hired before his death. Hazel soon learns that Doris's death was no accident. Someone had a secret, and they wanted to keep it that way. 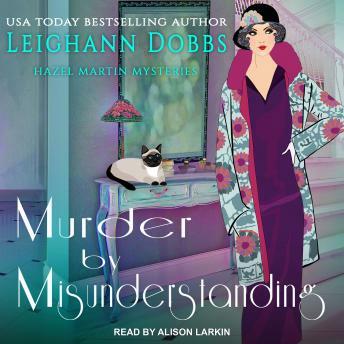 With her trusty Siamese cat, Dickens, by her side and handsome Detective Chief Inspector Gibson at her disposal, Hazel follows a trail of clues to reveal a surprise twist that even the killer didn't suspect.